1. SPCs Habit Buster Guidebook – containing all of the proven guidelines and techniques to break any and all bad habits quickly, easily and in days. 2. SPCs Habit Buster Biofeedback Card – a temperature sensitive biofeedback device that changes color as self-control increases and habits are broken. What exactly is the SPC HABIT BUSTER™ program? Would The HABIT BUSTER™ program work for me? Most habits are hard to break for two main reasons. First, many habits seem to fill a basic need most people have today – the need to relieve stress and/or the need for pleasure or happiness. Since the vast majority of people are either stressed or depressed a good part of the time, one can see how easy it is to fall prey to certain habits especially habits of excess. This also explains why people who stop one bad habit (e.g. smoking) without doing something about the need factor often find another (e.g. overeating) taking its place. automatically kicks in before the old one does. This handbook presents a program that has effectively dealt with both of these factors. Part One presents some simple but powerful SPC techniques for increasing your mental focus and willpower. This gives you a strong feeling of hope and confidence that you can indeed accomplish your goals. 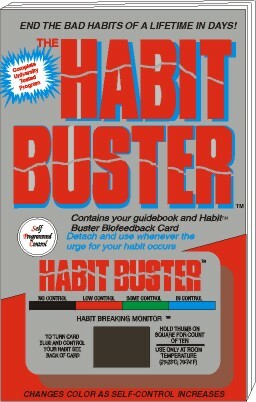 Part Two involves a unique biofeedback device called the Habit Buster Biofeedback Card. This device allows you to eliminate the urge or need for the habit right at the moment of need. Whenever you feel the urge, instead of reaching for your habit you will reach for the card and perform the SPC techniques on the back until the urge has disappeared. Part Three involves a procedure known as focused visualization or Self-Programming. In the more highly focused and relaxed state of mind produced by the SPC techniques, you will be able to self-program in the new habit so that it will automatically kick in before the old one has a chance to rear its ugly head. Such startling results show that habits can be broken easily by using these remarkable new techniques, all based on the power of your own mind. What some people call willpower, or self control, can be learned. You now have in your hands the tools that can break all of your bad habits, all you need is the commitment to use them.